I'm thinking maybe I should preface my review of this novel with something like 'All Hail the Glow Cloud', or 'I survived the summer reading program', or maybe something simple like 'when a person dies and no one will miss them, the mourning is assigned to a random human. That is why you sometimes just feel sad.'. Because, dear readers, I have been a longtime fan, and listener of this wonderfully bizarre, ongoing tale about a quaint little desert town. And that may make my review quite a bit biased. Consider yourselves warned about my bias. I loved this novel! Of course I did, the city council told me I had to, and if I say anything else about it I'm certain a member of the vague, yet menacing government agency will be by to show me how wrong I was to disagree. No really, I did love this book. Creators and authors Cranor and Fink have captured the off-the-wall feeling I get from the podcast in writing, and reading this book felt like an extension of their already existing world. 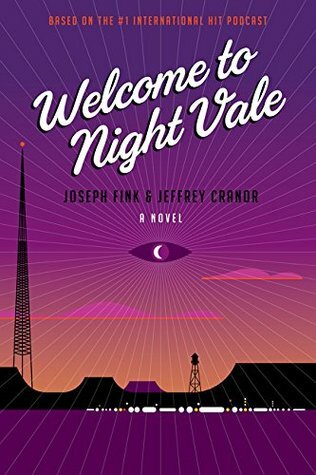 Welcome to Night Vale, the novel, has all of the same 'humor', 'mountains', and science I've come to expect from them. Add to that, an oddly touching pair of stories about growing up and not growing up, and I was thoroughly engrossed from the moment my fingers grasped the cover. I am eager for the next venture the WtNV world takes, and their track record's looking pretty darn good. So far, the podcast is amazing, the live shows are the best thing ever because going to one feels like a long awaited family get together, and the novel is so well done that even the hooded figures can't help but read it. -Physical ARC provided by publisher, in exchange for a review.